Last Wednesday I took you on a morning walk along one of our beautiful beaches and today I'm going to show you where I went when I left the beach. Remember, you can click on any images to enlarge them. I crossed Gulf Blvd. 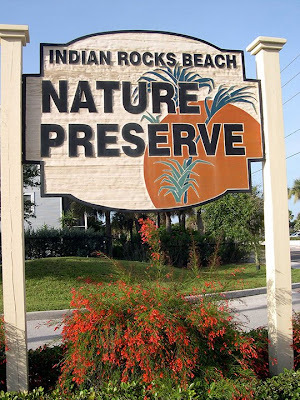 and entered the 9.3 acre Indian Rocks Beach Nature Preserve. 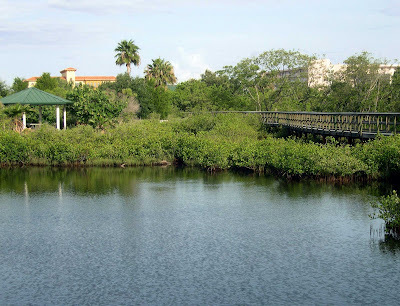 The preserve was established in 2000 and a portion of the boardwalk was constructed with resources recovered by FDEP and NOAA after the 1993 Tampa Bay Oil Spill, in which three vessels collided at the entrance to the bay, leaking over 300,000 gallons of heavy oil and 33,000 gallons of jet fuel. The IRB Preserve is part of the 400 square miles that make up Tampa Bay's estuary and the surrounding watershed covers an additional 2,200 square miles. An estuary, in case you don't know, is where the fresh water of creeks and rivers meets and mixes with the saltwater from the ocean. Mangrove trees grow throughout our estuary and they help to preserve our shorelines and act as a nursery to many fish, crustaceans and shellfish. Additionally they provide nesting areas for many of our birds. NOTE: Did you know that Tampa Bay has the most diverse colonial waterbird nesting colonies in all of North America? After walking over part of the boardwalk, I turn to show you how beautiful our preserve is and how close to civilization we are. See the roof over the tops of the trees? We walked past that building last week as we strolled the shore. The trees you're looking at are mangroves and IRB Preserve is home to the three types that grow in Florida — Red, Black and White. Mangroves are tropical trees that have adapted to our coastal environment by producing roots and leaves that can process high salt concentrations that other plants cannot tolerate. 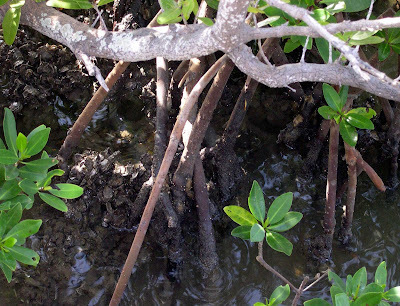 Red Mangroves are easy to spot because of their arching prop roots, which have caused them to be labeled the walking tree, because they appear to be walking on water. These roots supply air to the underground roots and add to the stability of the trees. Red Mangroves live closest to the water, followed by the Black Mangroves. 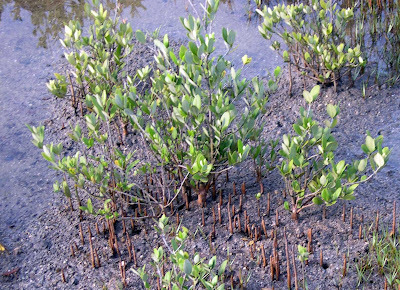 Black Mangroves are recognized by their finger-like projections, called pneumatophores, that surround the area around the base of their trunks. Pneumatophores grow vertically just above the water level and act as breathing tubes. I've heard these call dead man's fingers by local residents. Next up, on the highest and driest part of the tidal zone, are the White Mangroves. 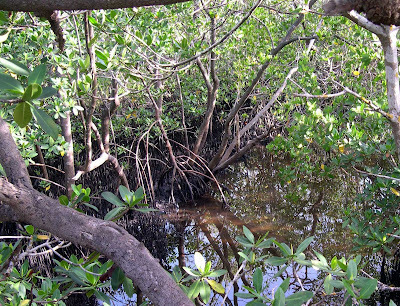 The larger picture in this collage shows the leaves and propagules of the Red Mangrove. A propagule is the sprouted seed of this tree. This seedling will eventually drop from the mangrove and when it lands in the water it will either take root or float with the current and root somewhere else. Seedlings can float around and remain viable for up to a year before they find a suitable spot to take root. 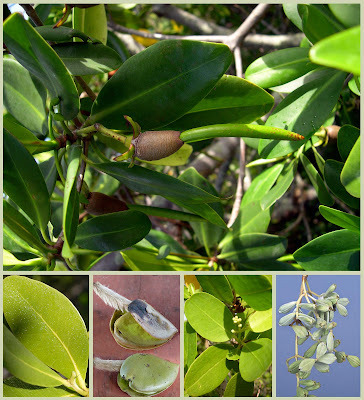 The bottom left photos show the leaves and propagules of the Black Mangrove. If you look closely you can see the salt that has been excreted by glands in the leaves. 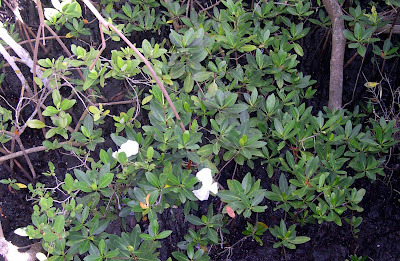 On the right are the leaves and fruit of the White Mangrove. The fruit contain a dark red seed that is also buoyant and can float to a new place to take root. If you look closely in the roots of the Red Mangroves you'll see some of our oyster beds. Oysters are immobile shellfish that filter water as they feed. You will find them in areas of the bay that receive a steady inflow of fresh water. 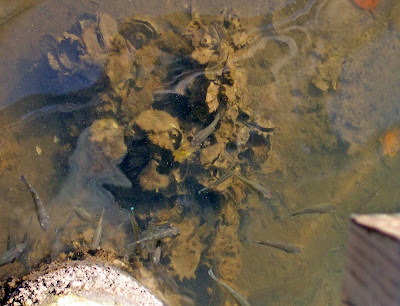 Earlier I told you that mangroves act as a nursery to many of our critters and in this photo you can see all the little fishes feasting in this safe environment. Alerted to danger they can safely swim and get lost in the tangle of prop roots, away from larger fish and preying birds. Well…sometimes. 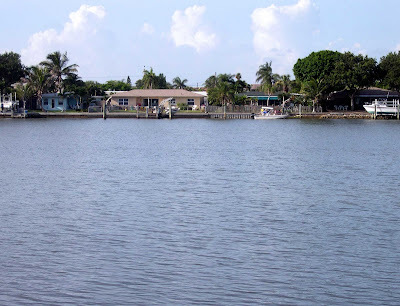 Fish typically found in mangrove nurseries are snook, redfish, seatrout, black grouper, sheepshead, mangrove snapper, tarpon, black drum and more. You can also see another oyster bed in this photo. 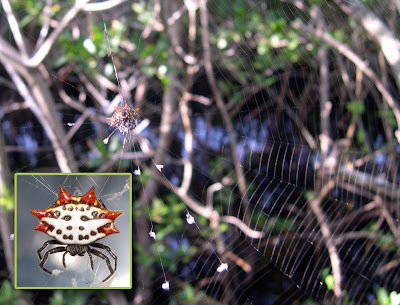 Another little critter that lives in mangroves is the Spiny Orb Weaver, doesn't it look like a crab? They look menacing in a photo like this, but they don't grow over a half an inch big and are harmless. I think they're cool…for a spider. Something that doesn't belong is pictured here. These are not flowers, but rather tissues someone shortly before me tossed carelessly over the boardwalk and into the environment. Now, there are trash cans located on the boardwalk and back at the entrance, so my question is why? I also spotted plastic bottles, the outside wrapping from a case of beer and a candy wrapper. Some of these may have been tossed here or off a boat, or they could have been washed into the bay from a local beach. I don't understand and will never understand such actions. According to the Florida Fish and Wildlife Conservation Commission, more than 85% of mangrove habitat areas in Florida have been lost since the 1940's. While mangroves can recover from the impact of a storm, it's up to man to stop their destructive ways. We have laws here to prevent residents from trimming mangroves so they can have a better view of our beautiful bay, a bay they obviously have no concern for. Chemicals used for garden and lawn care are washed into our bay with the rain, reeking havoc on this precious ecosystem, but still it continues. That's my soapbox statement for today. Let's continue walking. Well, I've reached the end of the boardwalk. To the South you can see some of the homes that line our bay. To the North is another view. Now, I took these photos one after the other and look at the difference in the sky. This photo looks black and white, but I think it looks peaceful, don't you agree? 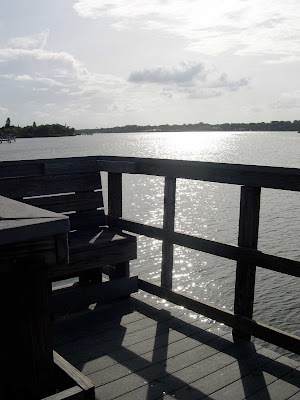 So, I think I'll sit here for awhile and enjoy the view before I join you at Susan's for more Outdoor Wednesday posts. Enjoy your day and remember — where ever you go, leave only footprints and take only pictures. Girl, you have just shown many of the reasons I love Florida so much! Thanks for sharing with us. Loved that little fiddler crab! Great place.Have never been there,but intend to go,now,in the very near future. Beautiful photos and educational to boot. So sorry that some people choose to use these beautiful places to discard their trash. Not cool. Thanks for sharing the pics and the great information. That crab must be a chic magnet! He's so fine looking with that yellow claw, lol! ...yes, thanks for the walk..., the little crab is awesome. When does one get to see that so close! Thank you for taking us on a wonderful walk and I didn't even have to sweat. Hi all and thanks for stopping by. Rain, because they cannot survive very cold winters, mangroves in the U.S. only grow in Florida and a few isolated areas of Texas and Louisiana. Like me, they prefer the tropics! The last few years we have visit Florida for the summer holiday's and have seen a lot of mangroves. They are so beautiful. We took a trail by car and have seen a blue kind of Crab. But the one in you're picture is so beautiful. Don't you just hate it when people litter such beautiful places? Makes me want to hide out and catch them. I really love your crab picture...he's cute, but I would hate to have him grab my toes! Hope you are having a great OW. I love visiting mangroves, what a lovely walk! Great images! So different from where I live -- I know there's beauty in nature everywhere in the world ... but you showed us a very special place. Thanks! Rhonda, just checking back in to answer about Jamestown. First of all, your ancestress must have lived through the horrible time when most of the colony died from starvation. I can't remember the exact date on that, but they had a particularly terrible draught (tree rings they found now prove this) where all the crops died. The colonists were forced to boil their shoes and Bible covers to get salt, and many didn't survive. Finally, help came, but they had a horrible go of things for a while with no supply ships. Some historians have written that they didn't survive because there weren't enough people who knew how to farm and work, but that simply is not the case. They died because even the Indians who knew exactly how to do those things were dying from the draught. The animals died, the crops died, and even the smartest farmers would have had a disaster on their hands. During the 1622 Massacre, my ancestor Richard Pace heard from a servant in his house named Chanco about what the Indians (Oppecancanough being the ring leader) had planned to do. They had planned to murder all of the English setllers in Virginia as they slept. Chanco couldnt' stand the thought of the Pace family being killed in their beds because as he said later, Richard had treated him like a son. So when Richard heard of the plot, he secured his property and rowed the James River in the cold to warn the settlers in Jamestown. As it was over 300 men, women, and children were massacred in their beds up and down the James river. Jamestown, however, was spared. I think there are plaques commemorating what both Chanco and Richard Pace did to help avert total disaster. They are both mentioned in correspondence of the period. What struck me about this was the fact that Richard Pace's kindness is what moved Chanco's heart. "He used me as a sonne" is what the report said. That and the fact that Chanco was a convert to the Christian faith were key in saving the rest of the colony. Richard was a ship's carpenter (ship builder) who ended up farming land (Pace's Paines), and he and his wife Isabella Smyth/Smith were both Ancient Planters. I'm also related to the Shepherds and supposedly to Samuel Maycock who was killed in the massacre. It would be something if we could find a genealogy connection, Rhonda! 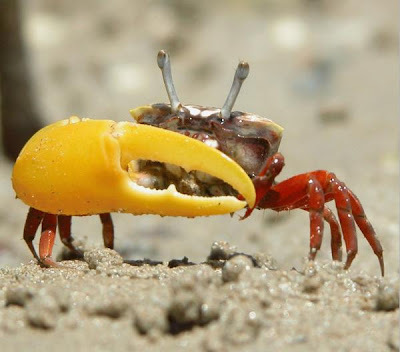 I would hate to get pinched by the fiddler crab with that over sized claw. Yikes. That yellow color is so vibrant. I enjoyed walking along with you in your part of Florida, you have me wanting to return for a visit. We lived there once a long, long time ago. I love mangroves. Unless I'm in a kayak trying to navigate through them, as I've learned. :-) Love these photos! And...oif I had seen the tissue-tossers...there's no telling what would have flown out of my mouth. Grrr. Great pictures! I need lessons immediately:) I had to repost my Mister Linky, so come back and sign up for Crock Pot Wednesdays starting on August 5. I LUV your blog. Great pictures and history lesson. I'm also with you on how thoughtless people can be when it comes to destroying nature just so they have a nice view :( Thanks for the beautiful walk! I'm really enjoying your blog! It has so much interesting information. I love to learn new things and I don't much about Florida. I agree wholeheartedly with your statement about human carelessness --I just don't understand people's laziness and disregard for nature. As you can imagine I unfortunately see a lot of that here in NYC. I'm adding you to my "follow" list on my sidebar.